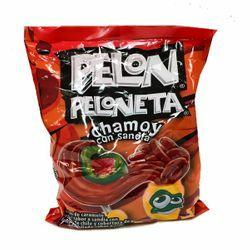 Pelon Peloneta Is a delicious caramel fruit flavored lollipop with a chilifilling that is covered in the succulent �Pelon Pelo Rico� pulp.Its a unique and scrumptious blend of flavors that you won't be ableto resist. It will keep your tongue tingling with incredible flavor,try it today! Naturally and Artificially flavored watermelon lollipop filled with chilipowder and covered with soft chamoy candy. Pelon Peloneta es una deliciosa paleta de caramelo con sabor frutal y unrelleno de chilito exquisto que viene envuelto con la pulpa delsabrosisimo �Pelon Pelo Rico�. Es una mezcla unica y riquisima desabores que no podras resistir. Le causara un hormigueo de saborincreible a tu lengua, pruebalo hoy mismo! Paleta de Caramelo macizo sabor a sandia con relleno de chile y cobertura dedulce enchilado sabor a chamoy.